Protected by the State of Florida and the US federal government under the Endangered Species Act. Non-aggressive species. Sometimes caught on hook and line by fishers that target sharks, tarpon, snook, and redfish. Should be handled with care and released unharmed. Disc angular, front edges nearly straight or slightly concave; snout pointed. Broad clear areas on both sides of snout (hence the name 'clearnose'). Single mid-dorsal ridge of large spines/denticles. Disc brownish with dark brown bars, streaks, and some spots dorsally and whitish ventrally. Well developed caudal fin. Dorsal fins present and located on tail. Found most commonly in shallow coastal waters but reported as deep as 1,000 feet of water; sometimes enters lower reaches (high saline) of estuaries and bays. Benthic feeder. Feeds mainly on benthic crustaceans, bivalves, marine worms, squids, and fishes. Breed while inshore. Oviparous; females deposit leathery dark-brown translucent egg cases, as many as 66 in a single reproductive season. Empty egg cases are often found washed up on coastal beaches; commonly called 'mermaids purses'. Benthic species. Inhabits coastal waters, including estuaries, lagoons and sometimes rivers. Feeds on benthic invertebrates, polychaete worms, small crustaceans, shrimp, crabs, mollusks, sometimes small fishes. Non-aggressive species of little danger to humans with the exception of their defensive venomous barb located near the base of the tail. Avoid handling or exercise extreme caution. 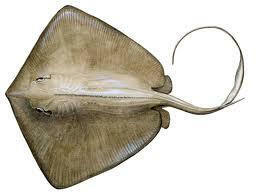 Do the "Stingray shuffle". Color brownish dorsally and whitish ventrally. Broad rounded disc. Snout short, relatively blunt (hence the name 'bluntnose'). Spine near base of long whip like tail. Well developed dorsal and ventral fin folds on tail which are dark brown to black in color. Inhabits coastal waters including ocean beaches, bays, estuaries, and river mouths. Generally found near shore on grass and sand/mud flats. Aplacental viviparity. Two to four pups per litter. Color dark brown to olive brown dorsally and whitish ventrally. 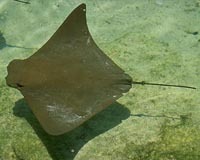 Disc broad but less angular than the southern stingray. The snout is moderately long and angular with an obtuse tip. Several rows of denticles/thorns on the tail (hence the name 'roughtail'). Large venomous spine(s) near base of long whip like tail (1-4 spines, some 8-10" long in larger fish). 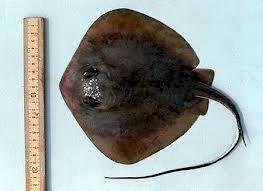 Long ventral fin fold on tail but much lower than in southern stingray, dark brown to black in color. Dorsal fin fold on tail absent. Dwells in muddy and sandy substrate. Inhabits coastal waters including ocean beaches, and some bays, and estuaries. It can be found at depths over 600 feet. 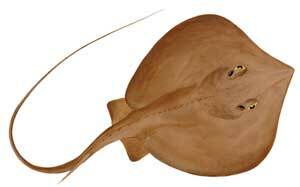 Largest whiptail stingray species in the Atlantic and Gulf of Mexico. Wingspan of up to 7.25 feet and up to 660 pounds. 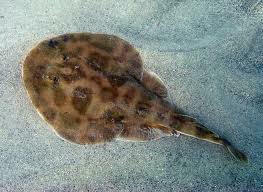 Prefers coastal waters and usually found on soft mud or sandy substrates. May enter estuaries or bays. Inhabits coastal waters including ocean beaches, bays, estuaries, and river mouths. Generally found near shore on grass and sand/mud flats but does venture into deeper coastal waters up to ~200 feet. Benthic feeder. Feeds mainly on bivalves and marine worms and also takes shrimp, crabs, and small fishes. Aplacental viviparity. Up to seven pups per litter. 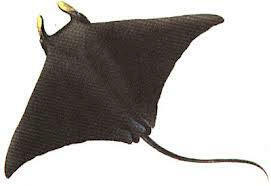 Wingspan of 4-5 feet and weigh up to around 200 pounds. Observed singly, in pairs, and in aggregations. Non-aggressive species of little danger to humans with the exception of their defensive venomous barb located near the base of the tail. Avoid handling or exercise extreme caution. Do the "Stingray shuffle". Disc round. Yellowish in color with darker vermiculations or spots dorsally, whitish below. Tail stout with caudal fin well developed (rounded). No dorsal fin. Venomous spine located just anterior to the caudal fin. A pelagic species found in bays, estuaries, river mouths, and open ocean. Forms large schools containing 100s or 1,000s of individuals. Migrates seasonally in the Gulf of Mexico and along the U.S. Atlantic coast. Present in some estuaries year-round. Non-aggressive species of little danger to humans with the exception of their defensive venomous barb located near the base of the tail. Avoid handling or exercise extreme caution. Commonly found in shallow inshore waters such as bays, estuaries, and coral reefs but may cross oceanic basins to depths of around 200 feet. Aplacental viviparity. Up to four young pups per litter. 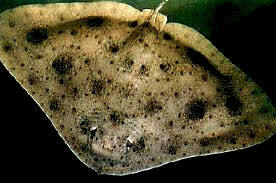 Grayish to reddish brown, with many rounded dark blotches that are outlined with blackish circles on the dorsal disc. Disc white ventrally. Round disc with a thick tail and well developed dorsal fins and caudal fin. No spine on tail. Two electric organs, set on either side of the head, are visible ventrally as kidney shaped honeycombs. Inhabits coastal waters, on sand or mud bottoms. 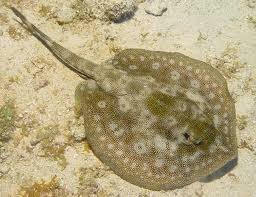 Common along sandy shorelines, seagrass beds, and sometimes near coral reefs. Found from the surf zone up to 200 feet. Benthic feeder. Prefers marine worms, but may take juvenile snake eels, anemones, and small crustaceans. Aplacental viviparity. Three to 15 pups per litter. Wingspan up to 18 inches. Non-aggressive species of little danger to humans. Can discharge a shock between 14 and 37 volts, primarily used for defense. Contact with the disc in the pectoral region can produce a mild electric shock, not enough to injure a human. 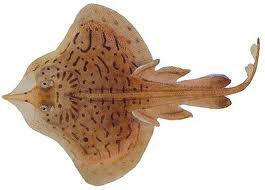 Guitarfishes have body characteristics similar to both sharks and skates. 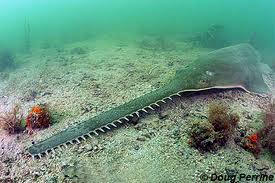 The body is dorso-ventrally flattened and the pectoral fins are fused to the head, creating a triangle or heart shaped disc. 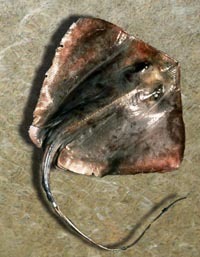 The tail is thick ending in a well developed caudal fin, typical of most skates. Two well developed dorsal fins are present and are located posterior to the pelvic fins. 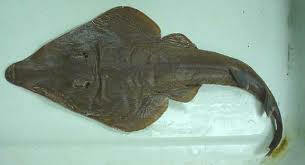 The combination of the disc shape and thick tail give this fish it 'guitar' like shape (hence the name guitarfish). No spine on the tail. Snout is pointed with broad clear areas on both sides. Found most commonly over sand and mud substrates in shallow coastal waters but reported as deep as 100 feet; occasionally occurs in estuarine and even freshwater habitats. Maximum length up to 30 inches. Dark black above, white below. Pectoral fins ("wings") long and pointed. Two large cephalic fins (rostra) protruding from front of head. Mouth small, sub-terminal. Tail whip-like, as long as the length of body and with no spine. Pelagic, occurs in shallow coastal waters and some bays, as well as open ocean waters. Wingspan up to 4 feet. Dark brown to black above, white below. Pectoral fins ("wings") long and pointed. Two large cephalic fins (rostra) protruding from front of head. Mouth wide, terminal. Tail whip-like, but shorter than the length of body and with no spine. 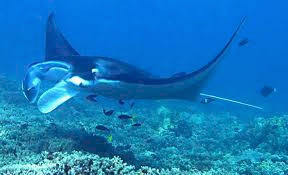 Pelagic, mainly in near-shore waters, near coral and rocky reefs; sometimes found over deep water near water's surface. Sometimes penetrates shallow muddy bays and intertidal areas, and occurs off river mouths. Aplacental viviparity; up to two pups per litter. World's largest ray. Wingspan of up to 29.5 feet with an average around 22 feet. Individuals may weigh as much as 4,000 pounds. Maximum reported age of 20 years. The prominent toothed snout makes this ray easy to identify. Usually 24-28 unpaired teeth on each side of the 'saw' (hence the name 'sawfish'). Found most commonly in shallow coastal waters but reported as deep as 400 feet; juveniles prefer shallow coastal waters including estuaries and adults are most often found in deeper water. Aplacental viviparity. Up to 20 pups per litter. Maximum length up to 18 feet. 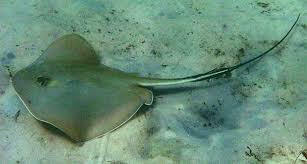 Saltwater Ray Fish Identification from Florida's Official Fishing Forum Site! 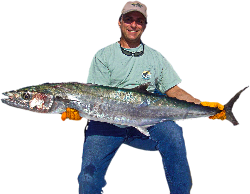 We provide Fishing Reports and Tips for offshore and inshore Anglers. 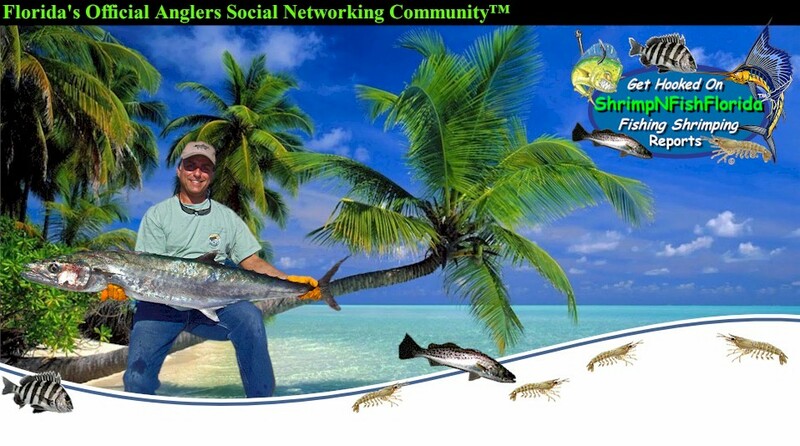 Florida the fishing capital of the world, has always been a destination for big game sport fishing. There are thousands of saltwater fish species found in Florida. Below are Fish ID with pictures of fish found in Florida waters. Details on each fish species, where to find them, and what they feed on. 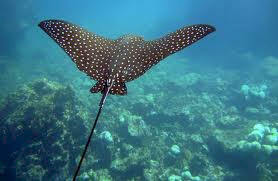 Commonly found along sandy beaches to the water's edge, and especially in sandy areas in and around coral reefs. Found to depths of ~80 feet.